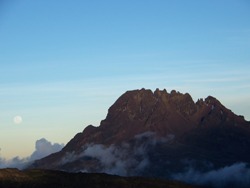 For a full trekking experience in Tanzania why not take in both of the country's 2 Highest Peaks - Kili and Meru. At 4566m Meru is no walk in the park - however, it serves as excellent acclimatisation, and is, in its own right an awesome trek! Your trek has had some considerable time and thought dedicated to its development. It is Adventure Café’s objective to get you to the tops of the Mountains safely, with the minimum chance of altitude sickness. We want you to actually enjoy the experience of standing atop the highest mountain in Africa. In order to do this, it is necessary to spend time at altitude, and to be patient, and wait long enough before making the final ascent of Uhuru Peak, and actually savour the experience. In Moshi—we shall be using a straightforward and simple hotel, with en-suite facilities. 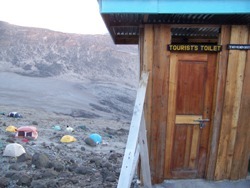 On the Meru trek you will be staying in a network of good, clean Huts. Whilst when doing Kili we shall stay in tented accommodation—actually a great way to stay warm on the mountain—the tent traps air very effectively and helps to insulate you against the cold night time temperatures. What is a Level 4.0 Trekking Challenge Like? You are now moving into the realms of serious challenges - where you are likely to encounter rough and steep terrain, sleep deprivation – ie very long days, or even high altitude. In any case - be prepared for an event which is going to take you well past the limits of your comfort zone. Trekking days will be up to 13 hours, or slightly less if the event stretches over several days. The severity of the challenge may be magnified by various factors - and you will need to be more resilient - variable weather conditions, simple food and maybe camping – these factors forms a part of the challenge. You need to be in good shape to undertake any of these events, and you need to be training regularly. The height gain each day is greater than for level 3 - so expect plenty of hills! A level 4 challenge would involve a very long day (in excess of 28 miles) or some serious hill climbing (multiple peaks in one day) - or possibly both! How Fit Do I need to be to join a Level 4.0 ‘Trek’? To participate in these events you need to be in very good fitness. You enjoy taking exercise, and do it regularly (a couple of times a week minimum). You may well partake in several different types of activity, possibly including the gym, swimming, running, or circuit training. You probably are capable of running up to 5 or 6 miles, but in a good steady speed (around 9-10 minute miling). If you do not run - you should be regularly undertaking challenging walks or other strenuous exercise. You should be comfortable walking 17-19 miles in the English lowland countryside. US Dollars are the most convenient and convertible form of currency in many distant corners of the world - recommended! Year round warmth, some rainy days - note that Tanzania has a rainy season - when climbing Kili is not recommended - this is March until May. The short rainy season does not present such problems - and runs October until early December.